Richard Green opened the discussion with a link to ‘Le Rémouleur’, an etching by Charles Émile Jacque on the British Museum’s online collection, which has a very similar composition to ‘The Knife-Grinder’. Green asked whether ‘The Knife-Grinder’ could be by Jacque or merely derived from him and outlined his probable inspiration from George Morland. Following Green’s promising case, Oliver Perry acknowledged another oil version of the picture once in the Giacomelli collection and compared it to both the etching and a painting in the Burrell Collection. After highlighting that all three paintings are on wood and analysing the contrasts between the various works in both size and technique, Green came across a monograph by Pierre-Olivier Fanica which incorporated a study of the agricultural background to Jacque’s work. 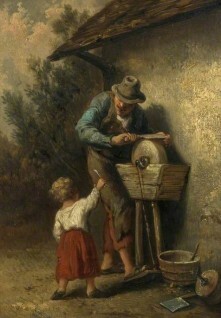 This led Green to Jean-Pierre Chambon, who suggested that due to inadequacies in both the perspective and draughtsmanship, ‘The Knife-Grinder’, although probably painted in the nineteenth century, cannot be attributed to Jacque. As a result, Green suggested that the painting be reattributed to ‘after Charles Émile Jacque (1813–1894)’. With Frances Fowle (Art Detective Group Leader for Continental European after 1800) in agreement and in the absence of contradictory evidence, ‘The Knife-Grinder’ has been acknowledged as a copy of Jacques’ ‘Le Rémouleur’ (previously in the Giacomelli collection), possibly based on the 1850 etching printed by Auguste Delâtre, or on both the original painting and the print. The discussion reached a close with the Wisbech & Fenland Museum being contacted about the outcome. Could 'The Knife-Grinder' be the work of Charles Émile Jacque (1813–1894)?